Google Reader’s aesthetic made reading news a migraine–more of a chore than an enjoyable experience–so two Stanford engineers set out to design a better product. If you’ve ever experienced Google Reader, the web-based aggregator of RSS feeds, then you’ve experienced ugly. It’s a basic utility lacking any design appeal, cluttered with text and blue hyperlinks. But for Akshay Kothari, the cofounder of Pulse, Google Reader served as an inspiration. “The first design was a total disaster,” Kothari says, laughing. Google Reader’s aesthetic made reading news a migraine–more of a chore than an enjoyable experience–and he and fellow engineer Ankit Gupta set out to design a better product. 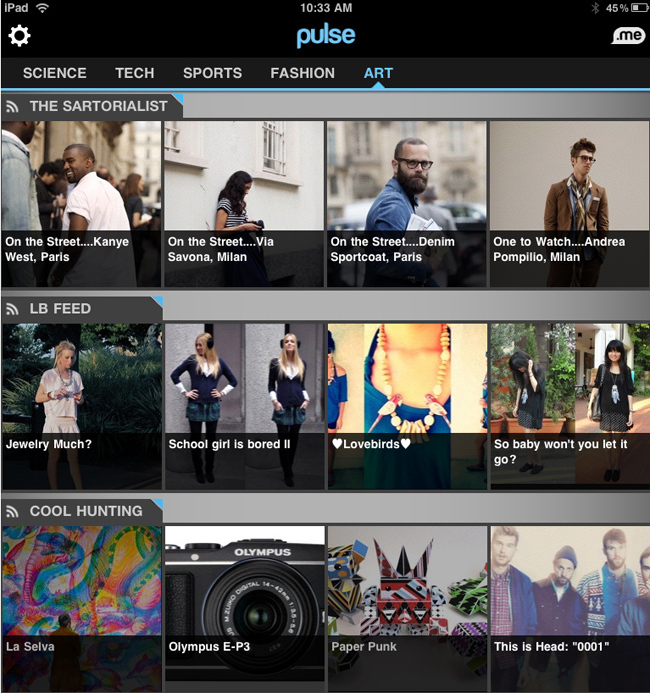 In just six weeks, the two had created Pulse, a sleek news-reader app for the iPad. (It’s now available on other iOS- and Android-based devices.) In just a little more than a year since its launch, Pulse has rocketed to 4 million users, and their company, Alphonso Labs, has raised $9 million in funding, and won a coveted Apple Design Award for its much-mimicked two-axis interface. But high-end design wasn’t always the focus of Gupta and Kothari, who had coding on their minds more so than any sense of aesthetic. Even with little cash, the two cofounders decided to hire a designer. “We said [to a visual designer], ‘We don’t have that much money. Can you spend just one full day with us?&apos;” Kothari recalls. As Kothari explains, the designer, a classmate from the Stanford D-school, “took out all the crap,” leaving a stripped-down, simple UI where the “content does all the talking.” The upgraded version shot up to the top of the app store charts almost overnight. And a week later, Pulse hit an extraordinary (albeit unexpected) milestone. For these engineers, the biggest discovery was design’s import in product development. For any other born-engineers out there interested in trying your hand at your own startup, Kothari has one bit of advice.